This filter is constructed from optical glass for clarity as well as color fidelity. It also features a black, aluminum-alloy filter ring for durability while remaining lightweight. Black, aluminum-alloy filter ring helps to provides additional strength while remaining lightweight. 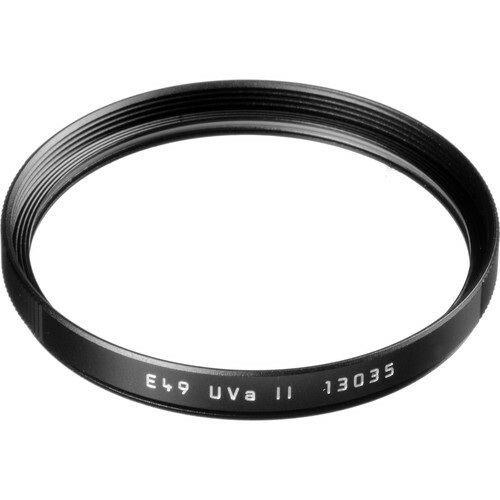 E49 UVa II Filter (Black) is rated 4.6 out of 5 by 5. Rated 5 out of 5 by PhotoDave from Good investment for the best lenses It may not be much better than the best B&W filters, but when you're investing in Leica lenses, why not put the same glass on the front? Rated 5 out of 5 by Dan from Does the job Bought this as protection for my Leica Q. Does the job. I can't say it's better than the B&W's I have on my other lenses, but optically, I can see no difference in images taken with or without the filter. Can't argue with that. Can the Leica Q lens hood still be used when this filter is mounted on the lens? Ye it can. There is ample clearance provided. The box shows made in Japan.